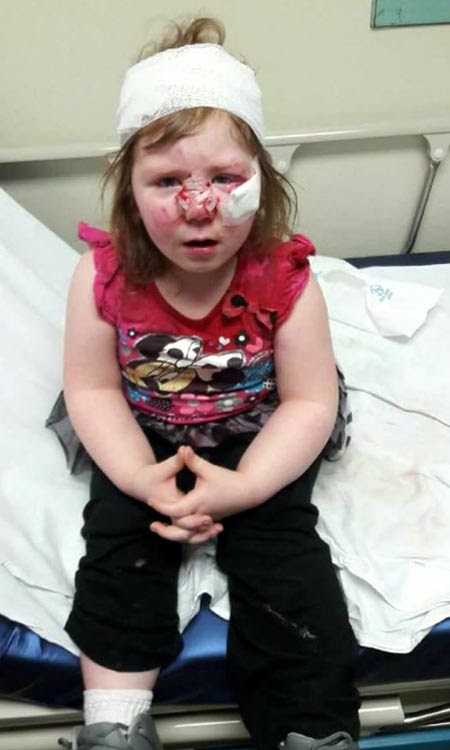 Ohio: "Prayers for this little girl she got attacked by a pit bull"
Prayers for this little girl she got attacked by a pit bull. — with JoAnn Shaeffer Welshans. Jaime Brunkan Dial - Poor thing!!! Her own dog?? 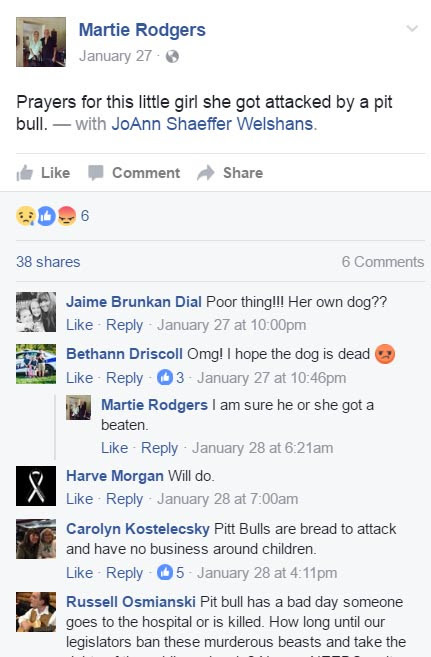 Carolyn Kostelecsky - Pitt Bulls are bred to attack and have no business around children. Russell Osmianski - Pit bull has a bad day someone goes to the hospital or is killed. How long until our legislators ban these murderous beasts and take the rights of the public seriously? No one NEEDS a pit bull. Sherri Yocum - Why would anyone take the chance of this happening to a loved one? They're unpredictable no matter what anyone says. They were never meant to be family pets. Please do some research before bringing any pet into the home. 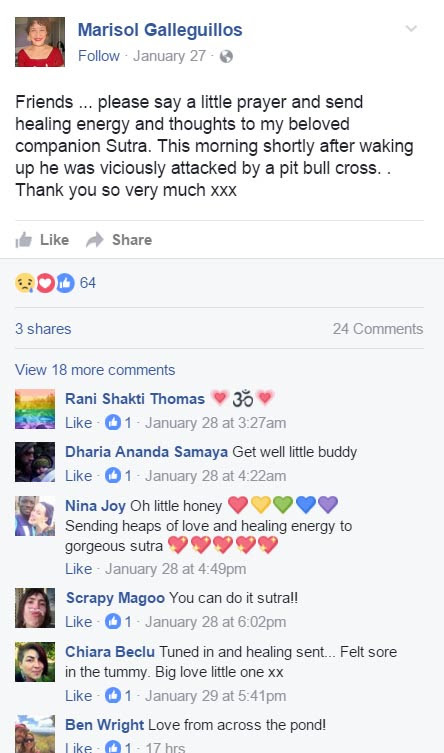 Australia: "Please say a little prayer and send healing energy and thoughts to my beloved companion Sutra"
Friends ... please say a little prayer and send healing energy and thoughts to my beloved companion Sutra. This morning shortly after waking up he was viciously attacked by a pit bull cross. .
LOUISIANA -- Two dogs were fighting for their lives in intensive veterinary care Tuesday after a wild chase involving Gretna police officers Monday afternoon ended with a burglary suspect running over the dogs in Coliseum Square in the Lower Garden District. 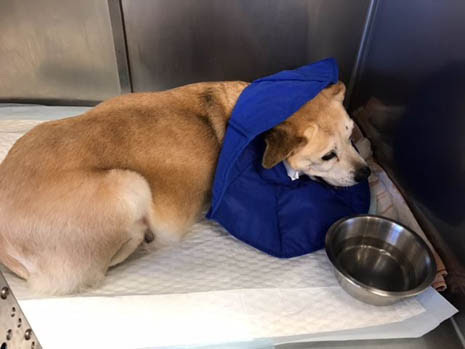 Jojo, a 17-year-old mixed breed, and Breezy, an 8-year-old border collie named after Saints quarterback Drew Brees, both suffered serious injuries, said Anne Bell, director of the Southern Animal Foundation. Bell said she fears the incident — which ultimately resulted in the arrest of 22-year-old burglary suspect Brandon Barthe — could have been far worse. Children were nearby as Barthe's vehicle careened through the park and hit the dogs, which lived at the animal foundation’s nearby headquarters, she said. 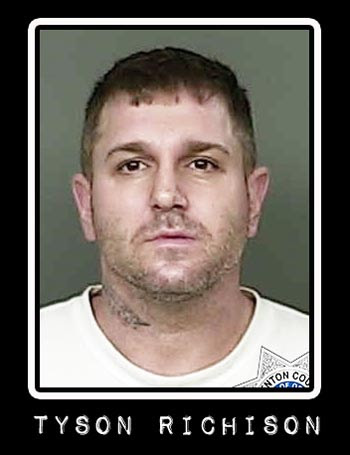 The chain of events began about 5 a.m. Monday when officers received a call about a burglary near Tulip Drive and Stumpf Boulevard, Gretna Deputy Chief Anthony Christiana said. Responding officers were told that the burglar had run across the street into an apartment complex, Christiana said. But he said the man, later identified as Barthe, was able to escape through a rear window. Detectives began canvassing the area and found a Nissan Murano that they believed belonged to the burglar. About 3 p.m., officers spotted Barthe driving it and took off in pursuit, Christiana said. The chase proceeded over the Crescent City Connection and into New Orleans. Barthe took the Tchoupitoulas Street exit coming off the bridge and continued upriver to Orange and Camp streets, where officers lost sight of him, Christiana said. Even after ending their pursuit, the officers continued to canvass the area in an attempt to find him, according to the deputy chief. About 3:30 p.m., Barthe crashed into Coliseum Square, where two employees of the animal foundation were walking Jo-Jo and Breezy, Bell said. “They were able to dive for the bushes, but they couldn’t get the dogs out of the way,” she said. Jojo’s hip was dislocated. Breezy suffered several broken bones. “You can see track marks on the abdomen,” Bell said. But it wasn’t just dogs whose lives were at risk. Bell said parents were grabbing students out of the way as the youngsters were leaving the nearby International School of Louisiana. The Murano passed close enough to one of her employees that he could feel it, she said. Christiana said the Gretna officers arrived about two minutes later and followed the marks left by Barthe’s Murano into the park. But he maintained that his cops were not in pursuit of Barthe when the dogs were struck. When the officers "realized they were in a park," they drove back onto the street, Christiana said. 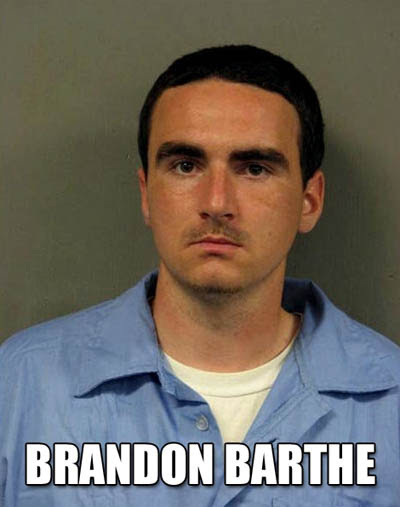 Barthe got away from the park, according to police. But about 7 p.m. he was spotted behind a hotel on the West Bank Expressway in Gretna and was taken into custody, Christiana said. He was booked on simple burglary, aggravated flight from officers and a probation violation. 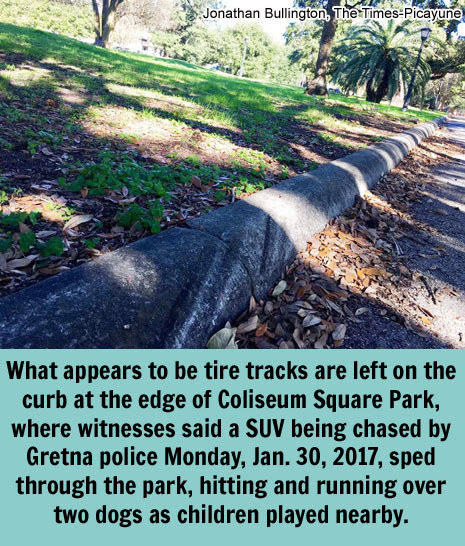 Whether Barthe will be booked in connection with anything that happened in Coliseum Square — including running over the dogs — is an open question. Massey said the case belongs to the Gretna Police Department. However, Bell said she believes the dog’s injuries should be investigated by the NOPD because the incident occurred in New Orleans and its police have jurisdiction there. 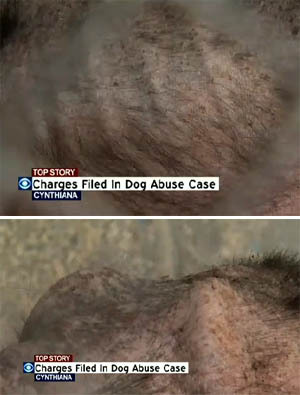 She expressed fear that the man who she said ran over her clinic’s beloved in-house dogs could get away with his crime. Bell said she does not know what will happen to Jojo and Breezy. Both are expected to undergo surgery. “I don’t know at the end of the day what’s going to happen, but they’re in the best hands. All we can do is pray,” she said. TEXAS -- A Bryan man who was attacked by two pit bulls while walking along Old Kurten Road in November 2015 was awarded a $5.1 million judgment last week, according to his lawyer. Joseph Mooring suffered numerous bites, requiring three major skin grafts and extensive surgeries, said his lawyer, Davis Watson. Mooring has permanent nerve damage to his right leg and his right forearm, where tendons were severed, and is no longer able to work. The judgment was signed Friday by 85th District Court Judge Kyle Hawthorne. Although he's entitled to the $5.1 million, Watson said the likelihood of Mooring collecting the money is slim, as it's not clear if there are any assets or insurance to satisfy the judgment. The attack occurred in the early morning of Nov. 3, 2015, when Mooring, who was 54 at the time, was walking along Old Kurten Road on his way to work at McDonald's. Suddenly and without warning, Watson said, two pit bulls charged Mooring as he crossed in front of a house, knocking him to the ground. Mooring doesn't remember the attack, Watson said, likely due to blood loss. 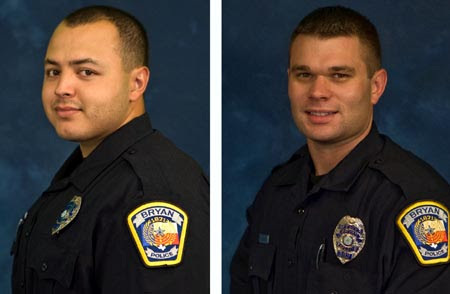 Two Bryan police officers who responded were credited with saving his life after noticing an arterial bleed on Mooring's arm and applying a tourniquet. Mooring was treated at St. Joseph hospital, where he stayed for a month and underwent six surgeries. His medical bills totaled more than $450,000. The dogs' owner, Gregory Flores Gonzalez, lived with his mother, Sandra Gonzalez, on Old Kurten Road. Mooring's lawsuit asserted that the two, along with Michael Gonzalez -- who was not named in the judgment -- failed to protect Mooring's safety, confine and control the dogs, handle them properly or train them to cease attacking upon voiced commands. According to the lawsuit, a neighbor who came outside during the attack had hit the dogs to get them to release Mooring, and the pit bulls had "numerous problems" in the neighborhood and were "known to be vicious." The lawsuit also sought damages for physical pain, impairment and disfigurement, mental anguish, loss of earnings and future medical expenses. Watson described Mooring as a healthy, hard worker who loved attending family functions and playing with his grandkids before the incident. Mooring now can no longer work or take part in the activities he enjoyed, Watson said, and his body "is completely scarred." 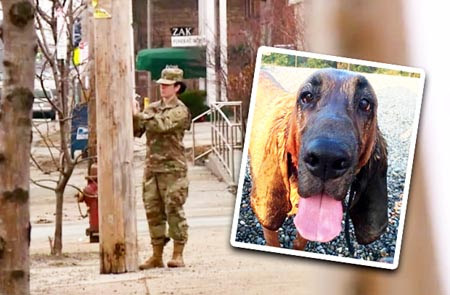 OHIO -- An Army private’s fight to be reunited with her dog intensified as the man accused of giving the Bloodhound away faced a judge. Angelo Sullo appeared in Cleveland Municipal Court Tuesday with his attorney. 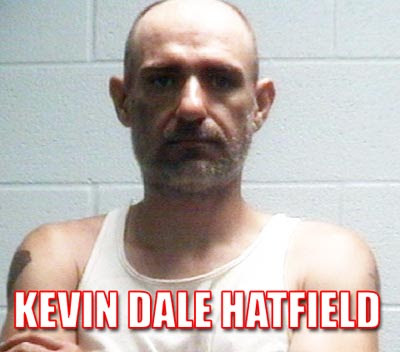 He has pleaded not guilty to a charge of petty theft. He says due to this case his family has received death threats. 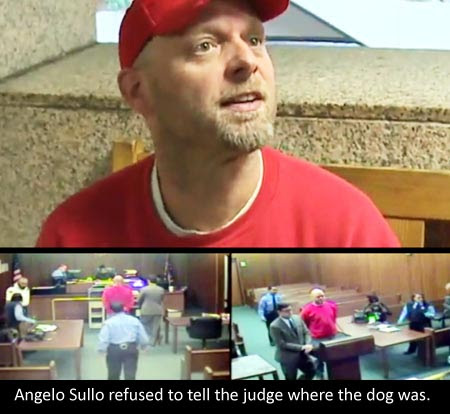 “My family, my ex-wife, it’s ridiculous,” Sullo told Fox 8. 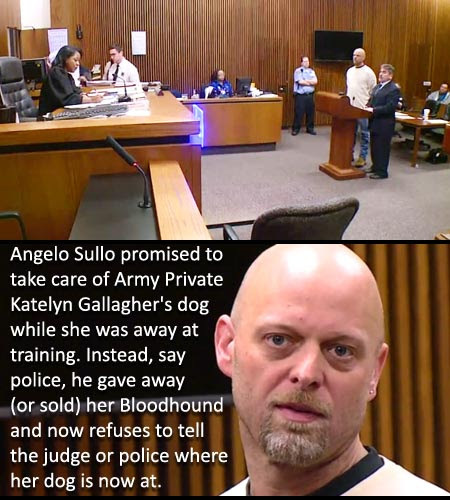 Sullo is accused of giving Army Private Katelyn Gallagher’s dog away, while she was attending military training out-of-state. Gallagher said Sullo told her he would watch Buck while she was gone. Sullo insists the case is a misunderstanding. 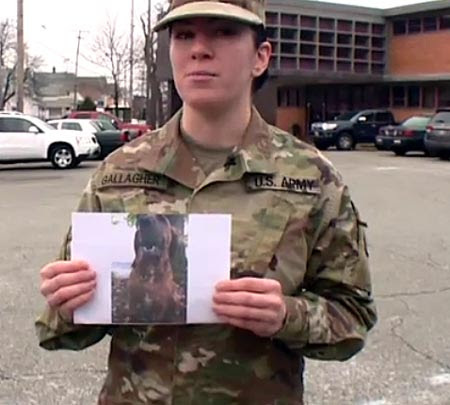 But Gallagher says she was never told there was a problem, and she learned that Buck had been given away when she came home on leave in December. She filed a police report. The family who has Buck now says they believe she gave away her rights to the dog. They say they adore Buck and plan to keep him. Gallagher is considering filing a civil suit. 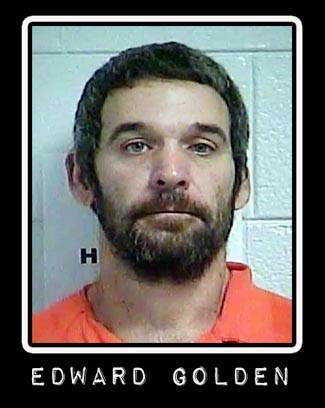 Sullo is due back in court in February. 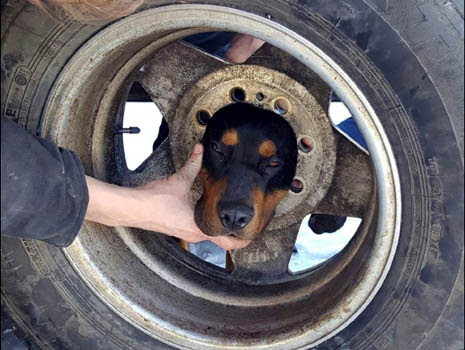 MONTANA -- An inquisitive dog named Blaze got into a very tight squeeze on Monday in Butte. 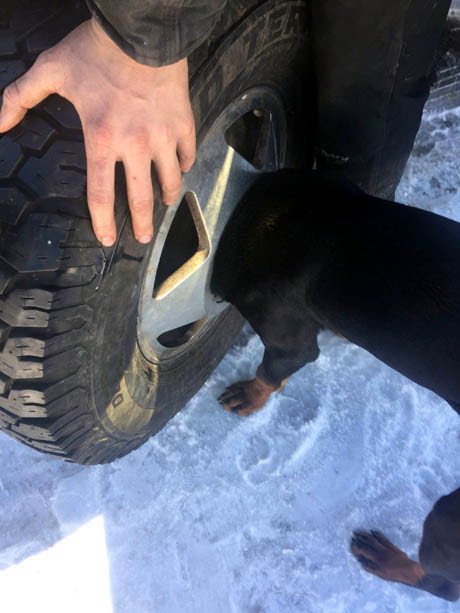 While his owner was away for a few hours, the eight-month old Rottweiler pup managed to get his head through the hole of a wheel - but then became stuck. 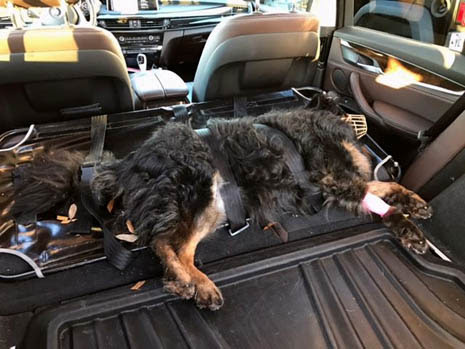 Blaze's owner contacted St. Frances Veterinary Hospital, who in turn called Butte-Silver Bow firefighters for some expert extrication assistance. In a Facebook post, Butte-Silver Bow Fire Department said that Rescue Unit No. 1 responded and was closely followed by the Fire Marshal’s vehicle. Getting Blaze out of the predicament required "a lot of coconut oil, patience, a lot of ear tucking, and some powerful skin-pulling" - and "Firefighter Zach Osborne's brute strength." Firefighters say that Blaze had some swelling on his neck, but otherwise is doing fine. The Fire Department noted: "Hopefully this was a valuable lesson for young Blaze, and we won’t have to respond to any more menacing incidents involving this playful puppy." WEST VIRGINIA -- What would allow a West Virginian who adopted a dog from a no-kill animal shelter to have that dog shot and killed? 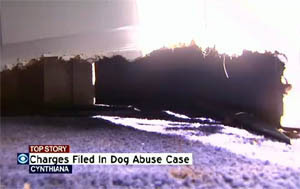 13 News found shelter managers fighting for justice, a dispute over the dog's temperament, and a county prosecutor whose decision goes against what he knows happened. Sara Dempsey said, "Bernie was executed." Cabell County's Little Victories Animal Shelter director went through the usual, meticulous background check she does with everyone who wants to adopt a pet. Little Victories is a no-kill shelter. 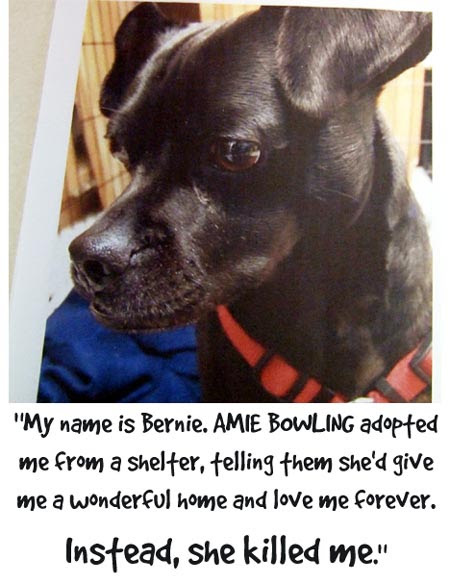 In October, they adopted out a Pug mix named Bernie to Amie Bowling of Hurricane. But in November, the shelter found out that Bernie had been shot and killed at the owner's request. When we went to owner Amie Bowling's house, she refused to speak with us, only saying, "I adopted it but I didn't do anything to it. My neighbor did, and now sir, please go." We asked neighbor Sam Rife how he shot the dog. "Just right back there in your woods, huh?" "Rifle or pistol?" we asked him. Shelter Director Sara Dempsey told 13 News, "Bernie was a little defenseless, sweet fun loving dog. Just four days before they killed him, we were told that everything was going great." Sam Rife claimed, "It was a mean little dog. It bit both her boys and bit me too. So, You took it into the woods and shot it? "Yes" Rifle matter-of-factly said without emotion. Bowling's next door neighbor, Dreama Fain told us Bernie was sweet, gentle and often fled to her home for food, affection and to escape cruelty. Fain said, "I've seen Amie Bowling and her boyfriend hit on their animals." Was he a vicious dog as they claim? "No, No He played with my granddaughter." 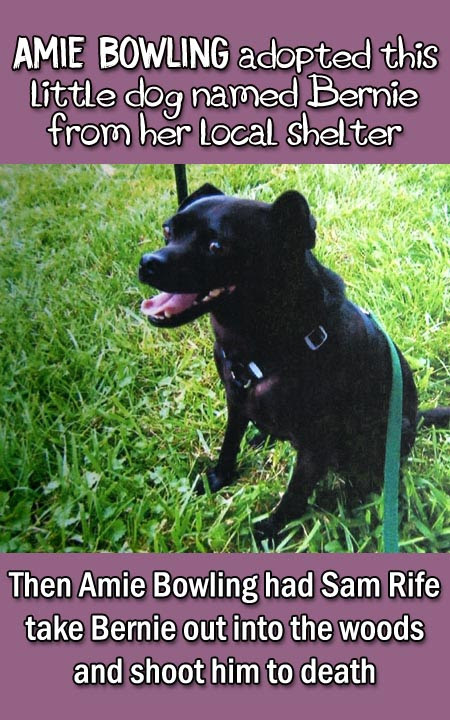 Sam Rife also told us Bowling had trouble keeping dogs in her yard and she should have taken the dog back to the shelter. Killer Rife claimed that Bernie was "not an adoptable dog". Bowling had signed a contract with Little Victories, agreeing that if there was any problem, she would return the dog. Sara Dempsey said, "We would rather take them back, do all we can to re-adopt and find a loving home." Fain, Dempsey and others called for criminal charges for abuse of an animal. Police were told by the suspects (aka killers) that the dog was a "vicious biter" and turned the case over to the Putnam County prosecutor Mark Sorsacia. The prosecutor told 13 News its commonplace in West Virginia for people to shoot dogs considered vicious. He did not believe this was a malicious killing, which would qualify it as a felony. So as long as someone claims the dead animal was vicious, they can get away with this in West Virginia. Sorsacia said even though he does not like or approve of what happened, this case is not prosecutable in this state. Little Victories will soon begin a social media campaign, to share Bernie's story. Little Victories says it is heartbroken over the county's legal response to what they see as a clear case of animal cruelty. The prosecutor said the rescue could file a civil suit in this case. Probably on the adoption paperwork it said that if the owner wanted to get rid of the dog for any reason they agreed to return the dog to the rescue - not to sell it, give it away, take it to the pound OR KILL IT. 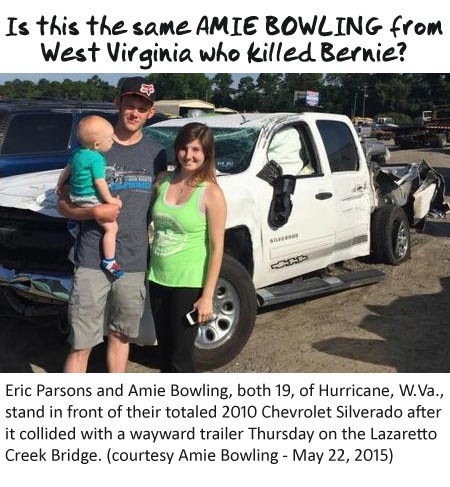 By killing Bernie, they violated the contract so they might be able to sue them for that. Small solace for Bernie. The no kill animal shelter says it is leaving that door open for now. California: LA Animal Services continues to push aggressive pit bulls onto the public... does anyone care? CALIFORNIA -- Priscilla Romero, a beloved and respected ten-year veteran Animal Care Technician (ACT) at LAAS North Central shelter, credits the heroic and selfless efforts of her coworkers with saving her life when she was viciously attacked by a Pit Bull on January 14. Without hesitation, they ran to her rescue, risking their own safety -- knowing they could also become victims. The following is how Priscilla remembers this horrific event from her hospital bed, augmented by the emotional memories of shelter employees who were on duty that morning. As is customary on Saturday mornings, there had been early visitors in the kennels looking at dogs for adoption or searching for lost pets. 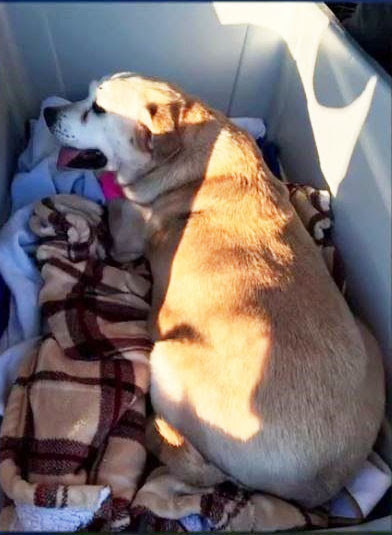 However, by around 10:30 a.m. members of the public walking in the kennels had diminished, leaving no one in the immediate area to hear Priscilla’s screams for help. Since the dog seemed calm and was standing quietly near her, Priscilla scooped the feces from the floor and reached for the hose to wash the kennel. Without warning, the Pit Bull lunged at her, clamping onto her right arm, disabling her from reaching her holstered radio to call for help and pulling her to the floor. The dog then attacked her left arm, tearing out large chunks of flesh and muscle. Because of the loud barking of dogs alarmed by the attack, Priscilla's screams could not be heard at the front of the shelter where most other staff was working. Fortunately, two male ACT's were approaching the area at that time. They heard her cries and saw her covered in blood, struggling on the floor as the dog relentlessly bit and shredded her arm. As they ran to her, one made a radio "distress" call for assistance. Other ACT’s and the Kennel Supervisor immediately rushed to help, calling 911 and bringing a "catch" pole. The first ACT's were trying unsuccessfully to physically separate the dog from Priscilla, but it kept circling back to attack her and charge them. The Supervisor then arrived with another employee and used the pole to capture the dog. Seeing blood flowing profusely from Priscilla's upper left arm, Kennel Supervisor Garens Lloyd quickly used a dog leash to create a tourniquet and apply it tightly above her wounds. Two male ACT's removed their shirts and covered her arms to soak up the blood and also, so she would not see the severity of the attack. Paramedics arrived shortly and commended Garens for his quick action. The doctor later said the tourniquet was done perfectly. One fireman commented that Priscilla’s injuries looked like a "shark attack." Priscilla was admitted to the hospital in critical condition. She underwent emergency surgery that lasted over five hours. Both arms are bandaged from her fingers to her shoulders. From photos, it appears her entire left biceps are gone. She was hospitalized for six days and may need numerous reconstructive surgeries. No one from LAAS management visited Priscilla at the hospital, although shelter employees from the Valley to the Harbor came. GM Brenda Barnette called Priscilla’s cell phone the day after the attack, saying, “I’m checking in to see how you're doing” and left a short, awkward, dispassionate message, which did not include "I’m sorry this happened to you." Brenda Barnette doesn't seem to think employee injuries are serious incidents. At the last LA Animal Services Commission Meeting on January 10, GM Barnette laughed as she described the injury to an LA Animal Services Officer attacked by an aggressive Pit Bull while responding to a call. She laughed again as she announced a second injury when the officer was later attacked by a 160-pound dog and had to fight for his life. This is not the first time GM Barnette -- who has no animal control experience--chuckled about an employee being attacked in the shelter or field. The Commission, which heads LA Animal Services, has never questioned Barnette's inappropriate reaction and dismissal of the dangers to her employees. Neither has the Commission, Councilman Paul Koretz, the SEIU union, nor the Mayor's office insisted that corrections be made to many documented safety hazards at LAAS shelters or that faulty field equipment be repaired or replaced. LAAS employees are still driving 2001 and 2003 trucks that LA City's Director of Fleet Services, Richard Coulson reported to Koretz’ PAW Committee in Sept. 2015 were “falling apart." Another example of faulty equipment and poor management was the attack on a night-shift female Animal Control Officer, who responded to a call about two attacking Pit Bulls in Eagle Rock. The ACO captured one of the 90-lb. dogs (later identified as American Bulldogs) but the other bit her leg and wrist causing serious bleeding. There was no ACO back-up on night shift, her radio emergency button “went nowhere,” and no one answered the shelter phone. Luckily, a witness called 911. Cielo, the female Pit Bull that attacked ACT Priscilla Romero had two prior entries regarding aggression. Also, she was surrendered on Oct. 16, 2016, because she attacked other dogs. Still, she was being offered for adoption to the public. Since the real world is filled with “other dogs,” why isn’t known background information clearly described on a kennel card for prospective adopters to read? On Oct. 27, ACT Romero wrote that the dog bit her finger, but didn’t break the skin. 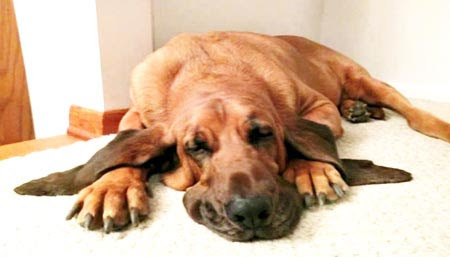 On Nov. 12 another ACT noted, "BE CAUTIOUS OF THIS DOG---DOG WILL GROWL, BARE TEETH AND TRIES TO BITE AS I’M TRYING TO OPEN THE KENNEL DOOR TO PICK UP EMPTY FOOD BOWL." Wouldn’t you want to know this before taking the dog home? Keeping behavioral records in the computer only is unfair to employees, who do not have time to check each dog for new information every day. There is no method at LAAS kennels to discover that a new negative behavioral warning has been entered, as at other shelters. Could this be because euthanizing dangerous animals would belie Brenda Barnette’s and Best Friends’ “no kill” claims? On Oct. 23, 2015, a stray blue-and-white male Pit Bull was impounded at the West LA shelter and named "Albert." On August 11, 2016, a man saw Albert and wanted to test his reaction to his daughter before adopting him. Albert seriously bit and injured the 8-year-old child, “… during an introduction to the family in the shelter’s play yard." A critical incident report filing was made. A Jan. 14, 2016, note on Albert predicted problems: “This dog is an escape artist….I would use caution around this dog, requires a very strong handler. WILL BITE WHEN IN KENNEL.” Why was Albert offered eight months later to a family with a child? Why was Albert still available for release to anyone after a critical attack on a child? And why are taxpayers paying for these prolonged stays for unadoptable animals? On April 28, 2016, a Pit Bull surrendered as “Sodam” (renamed “Sammy”) with-a-violent-history of repeated-aggression, and who had just bitten an LAAS kennel worker in the abdomen, was released to NovaStar Rescue at the personal instruction of LA Animal Services GM Brenda Barnette. However, the Hayden Bill does not require the release of surrendered animals to rescues. Sammy was alive but had been stabbed 19 times by a neighbor who heard the victim screaming. LAAS employees have expressed on-going concerns about prolonged warehousing of, especially, Pit Bulls, in the City's six shelters, where confinement and isolation increases the animals' hopelessness, frustration and aggression. Many of the Pit Bulls shown on the LAAS site have been caged for months or over a year. Why? These dogs are miserable. They are not adoptable and they take up space that could allow dozens of dogs to find new homes during that same period. Nothing in California law requires dogs that have exhibited aggressive or dangerous behavior to be offered for adoption to individuals or families where they may attack/kill humans or other pets. But Brenda and Best Friends are determined to reach a metric called "no kill." If the dogs die from injuries or illness, they are not counted in the shelter's euthanasia stats. Are dog attacks just "business as usual" at LA Animal Services? 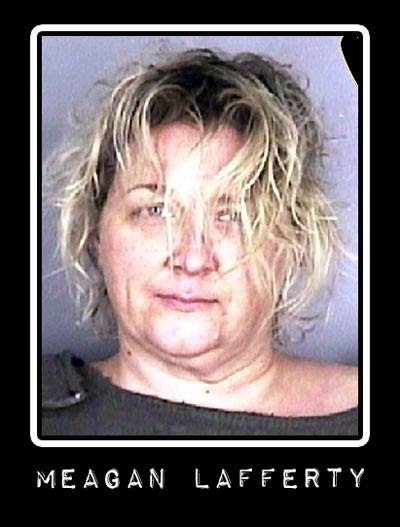 You have a serious problem within Animal Services starting and ending with Brenda [Barnette]. An hour ago a fellow employee was wheeled into the medical room, in shock, with a tourniquet on her left arm, pale as a ghost, and with tissue strewn across her chest. Employees also in shock, some crying. Paramedics responded quickly and rushed her to the hospital. The lack of response of your office, the negligence, and the dereliction that starts as your responsibility is atrocious. You should be ashamed, as this person is a friend and a good employee. Our response from our AGM after being notified and asked to temporarily close the shelter, was that 'dog bites happen all the time.' To be clear there are dog bites, and I've bandaged them, but this was a mauling. This mauling, as most are now a days, was predictable. You the mayor, with the goal of "save them all" have increased and, in fact, demanded that the nature of employee's being attacked, is acceptable. Our kennels are full, dogs are in inappropriate cages, aggressive dogs are held perpetually until our statistics show that we euthanized one less dog than last year. Our general manager isn't here. Why not? If I firefighter was injured on duty, or an officer shot, would the commander tell them "buck up, it's a function of your job, get back to work?" Or would they show leadership and understanding and go to the hospital to personally show their condolences. This department is ridiculous and it's happening under your auspices. This time around I imagine the city will be sued, as this dog has previous memos of its aggressive nature and was otherwise placed in a public area. I'm sorry if this is bad form, but I'm slightly traumatized by this as well. It is time for a grand jury to investigate why “no kill” is more important to the Mayor, Council and Brenda Barnette than protecting humans, ensuring the welfare of employees like Priscilla Romero, and safeguarding children and pets from aggressive/fighting-breed dogs. It also needs to determine the total cost of "no kill" to taxpayers. A grand jury should audit how much money is being contributed to LA City political campaigns and/or elected office-holders’ charitable accounts by all humane organizations (including their for-profit and non-profit affiliates/partners) which have programs or contracts with Los Angeles Animal Services and which demand/encourage the very inhumane "no kill" agenda. The focus of that myopic agenda necessitates the warehousing of aggressive/fighting dogs and other animals in city shelters despite documented evidence that they pose a safety hazard to employees and the public. "No kill" garners big donations from those who don't understand the suffering of these caged animals. It is time to acknowledge the misery and dissect the underlying financial motivation. OHIO -- A Lorain woman was issued summons for three counts of cruelty to companion animals after police found the dogs malnourished and filthy. 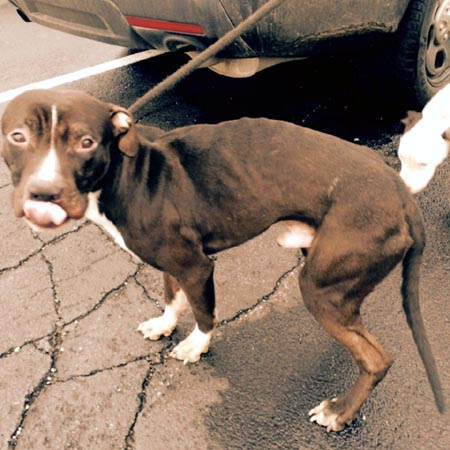 Police were called just after 11:45 a.m. Monday to investigate a report of three malnourished dogs, who belong to Dwana Smith, running around in the area of West 8th Street and Lovett Place, according to a police report. The three dogs were found running around and tearing into trash bags, eating what garbage they could find, the report says. The dogs also were fighting over the scraps, the report says. The dogs were filthy and the two female dogs had blood on their fur and minor bite wounds from fighting over food, police say. All three of the dogs' ribs and pelvis bones were showing. None of the dogs had collars or tags. Police noted the dogs were friendly and not aggressive to each other when food wasn't around. The person who called about the incident pointed police to an open back door in the 800 block of Lovett Place. The officer went through the open door, down into the basement and up to a closed door to the first floor of the home, according to the police report. 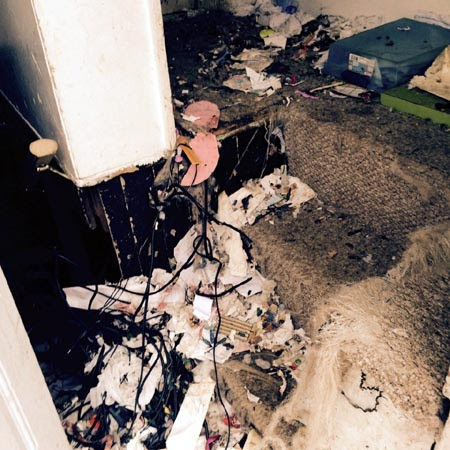 The landing was covered in insulation, wires and other building materials as if the dogs clawed the walls to get out, the officer noted in the report. Police have been to this home before over tethering complaints of these same dogs, the report says. 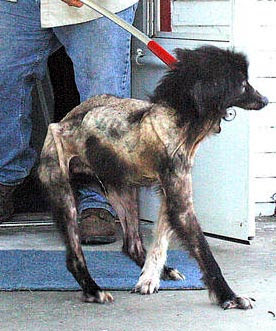 The dogs were taken to the Friendship Animal Protective League, the report says. Smith used the excuse that she "is a single mother and is suffering financially", the report says. She also was in a support boot and unable to get around. Her children are too young to help, the report says. A friend of Smith's had been taking care of the dogs, but no longer does, the report says. 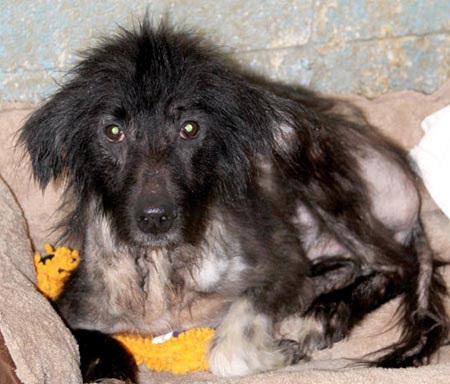 Police are asking the court to consider her situation and willingness to surrender the dogs. 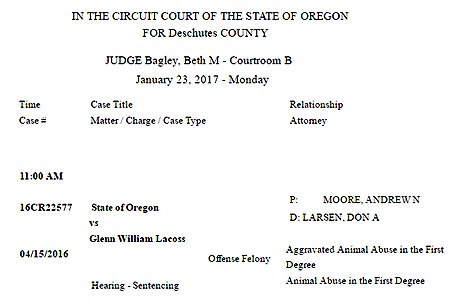 OREGON -- Back in April 2016, Glenn Lacoss was charged with animal cruelty after his neighbor found her beloved cat named Sweetie hanging from a fence. Police were called to the home and said they arrested Glenn William Lacoss, 55, after he told them he killed the cat because it was scratching his trees. 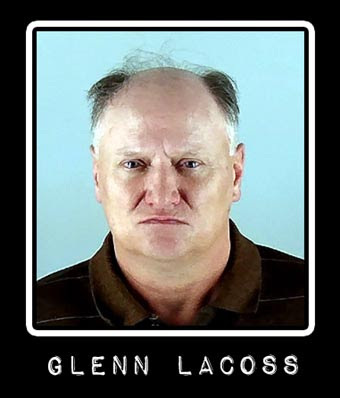 Investigators said Lacoss told police he was upset there were feral cats in his backyard. Her owner believes Lacoss beat the cat and then hanged her from the fence, letting her strangle to death. According to the DA’s office, markings on the fence show Sweetie struggled before she died a horrific, slow death. Records show that Lacoss was to appear in court on January 23, 2017 for "Hearing-Sentencing". My bet is they gave him probation with no jail time. FLORIDA -- A cattle owner stumbling upon a disgusting case of animal cruelty on one of his own. This animal cruelty case brought sheriff’s investigators to this remote area in Loxahatchee in the 6000 block of Dennis Street. This is way, way out here, in an area where there are few roads. Nothing but canals and pastures. Sheriff’s officials say a rancher was trying to feed his cattle when he made the shocking discovery: a severed leg belonging to one of his 1500 pound bulls just west of his pasture. Investigators say the culprit or culprits left behind a saw, a wooden pallet and raincoats. This incident was reported January 1. Since the bull is such a heavy massive animal, it would seem that this had to be the work of at least a couple of people, perhaps more than that. 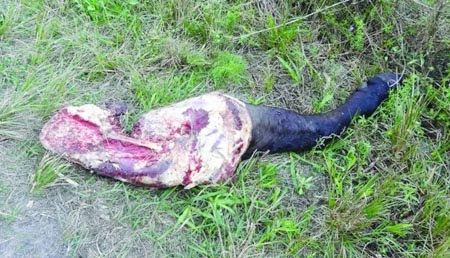 Last month three decapitated animals were discovered also in western communities in Palm Beach County. A horse’s head with a bullet to the skull, found in the Acreage. 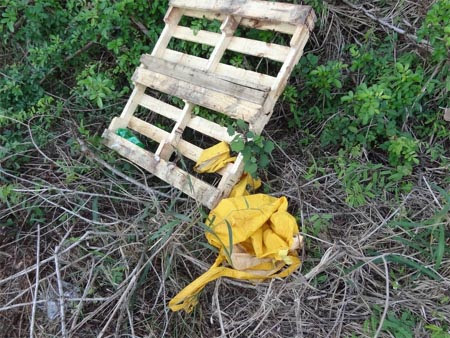 The same week, a decapitated goat and rooster were found in Loxahatchee Groves. Animal Care and Control said those two decapitations appear to be a ritualistic killing. The sheriff’s office has not said if the cases are connected. TENNESSEE -- One Chattanooga woman is happy to be alive after a frightening encounter with a pit bull. The animal had her cornered on her own front porch. 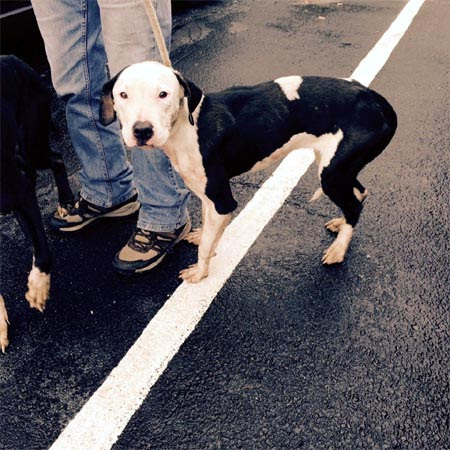 Cathy Ryan was simply sitting at the foot of her home when she noticed a pit bull, with tags, coming down the street. When the dog approached, that’s when things went south. ” And when I got up thinking you know I go look at the tag. I got up and I told my husband. ‘Come and look at this beautiful beast’ and when I did it come up on the porch with me. All teeth, jaws and pinned me up between my light fixture and my door knob it was not gonna let me in that house,” said Cathy Ryan. This attack comes days after yet another pit bull killed one child and injured two others in Atlanta, spiking up the numbers yet again for fatal dog attacks. Recent statistics from DogBites.org show 82 percent of fatal dog bites come from Pit bulls, with Rottweilers coming in a strong second. Because of these attacks, some cities have already banned ownership of this particular breed, but according to Ryan, it’s not always the dog’s fault. “All dog owners should take care of their dogs. It’s not the pit bull’s fault, it’s the owners,” said Ryan. 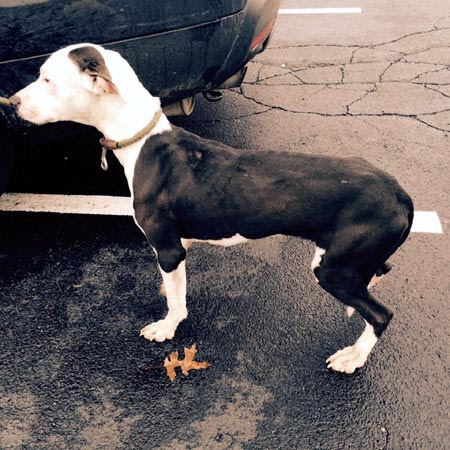 As far as a visual goes, Ryan describes this local pit bull as having a similar body shape as shown here, but blue in color and with a white star going down its chest. 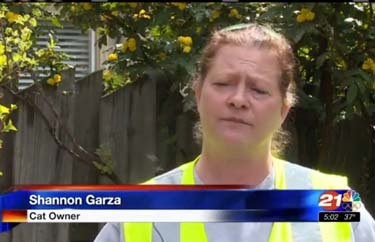 She also tells News 12 that is has already bothered some of their neighbors as well. If you have any information about the pit bull’s whereabouts or know its owner, contact your local animal rescue team. 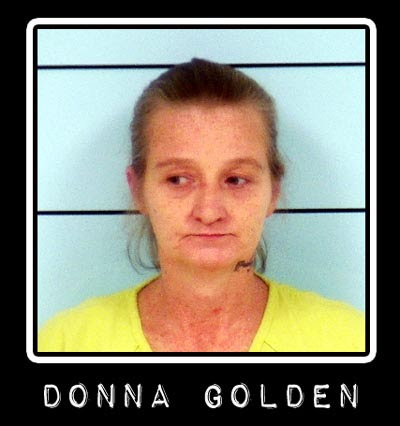 KENTUCKY -- It appears that animal cruelty charges were filed way back in 2012 for Edward Golden and Donna Golden. 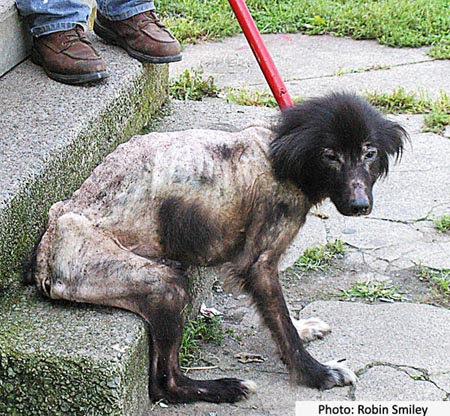 They were accused of abandoning their border collie mix to starve to death in a house they'd moved out of. 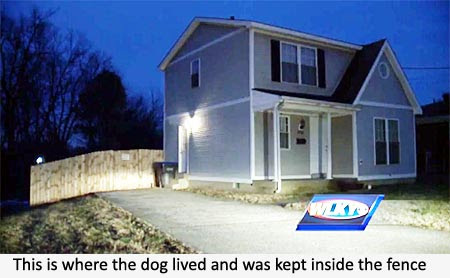 Authorities suspect other animals had been locked in the basement as well. Feces covered the floor and there was a hole in the back basement door. He said the hole appeared to have been chewed or scratched open for escape. There were several articles posted in 2012. However, the stories stop so I suspect that they've been on the run all this time and have finally been caught and will face the consequences of what they've done to this poor dog. KENTUCKY -- A family's pet dog is shot and killed and police say the man living next door is responsible. 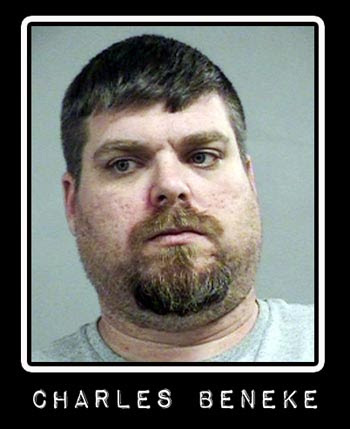 On Friday, Louisville Metro Police Department officers arrested Charles Beneke, 38. 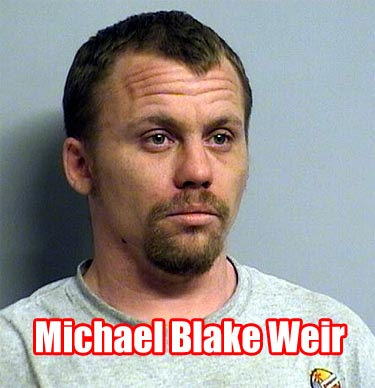 He was charged with animal cruelty and booked at Metro Corrections. 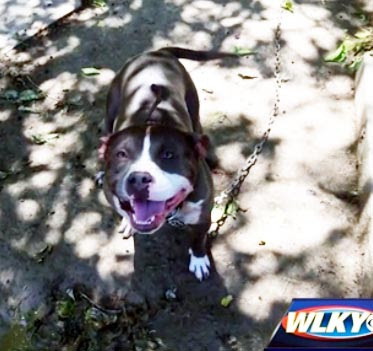 The arrest comes weeks after the death of Cassandra Dunnaway's blue pit bull, Coco. 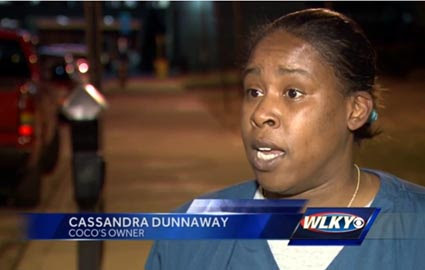 Coco, who was about 1 year old, had been shot several times Nov. 2nd. 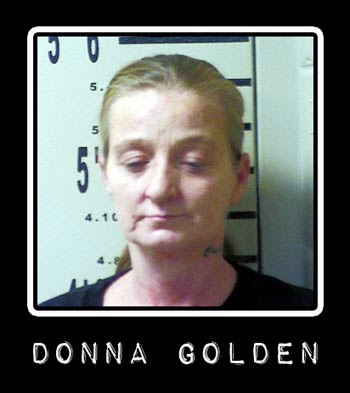 Dunnaway said she and her husband had not been home at the time, but had gotten a call from a concerned neighbor. "He said, 'Well, I just heard three shots and I heard your dog barking and I don't hear it barking anymore.' My husband was just a few blocks away and rushed home," she remembered. The couple found their dog lying against the fence. 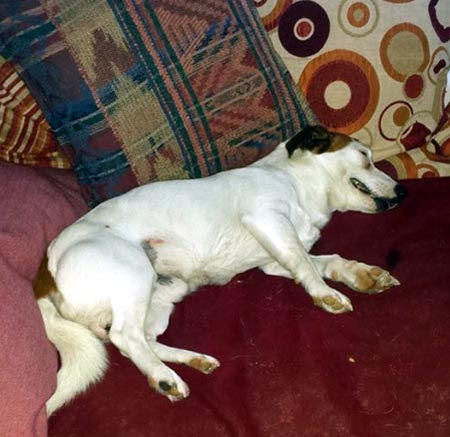 Dunnaway said the dog had been shot three times in the head. "I replay that over and over in my head, of her just laying there. Looking at me, like, 'Mom, help me,' and there's nothing I can do." According to court documents, Beneke admitted to shooting the dog, saying Coco had charged at him. The dog was later euthanized at the vet's office and the couple quickly moved out of their Accasia Drive home. "I had no choice but to move. It was either us move or us getting into a bigger situation," she said. 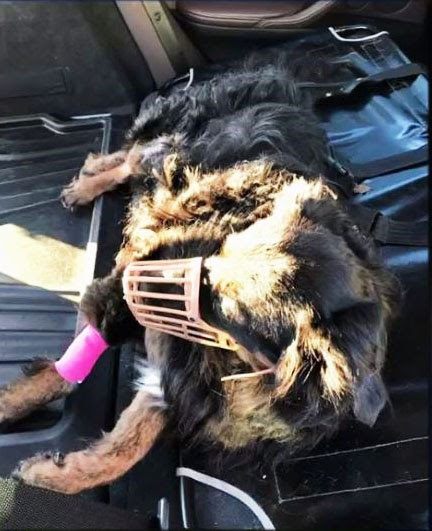 In fact, during a three-month period, she said Beneke called Animal Control 19 times, complaining among other things, that her two dogs were not being cared for. But according to Dunnaway, Animal Control never found any violations, and did not take action. She believes Beneke's actions Nov. 2 were not necessarily about the dog, but were personal. While Beneke did spend one night behind bars, Dunnaway said that is not enough punishment for the crime. She plans to contact the American Society for the Prevention of Cruelty to Animals and pursue legal action against Beneke. "I don't want him to think he can do it and it's OK," she said. 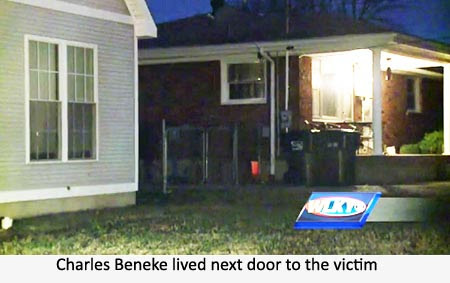 Meanwhile, the wife of Charles Beneke, tells WLKY there are two sides to every story and said Monday her husband had hired his own lawyer.